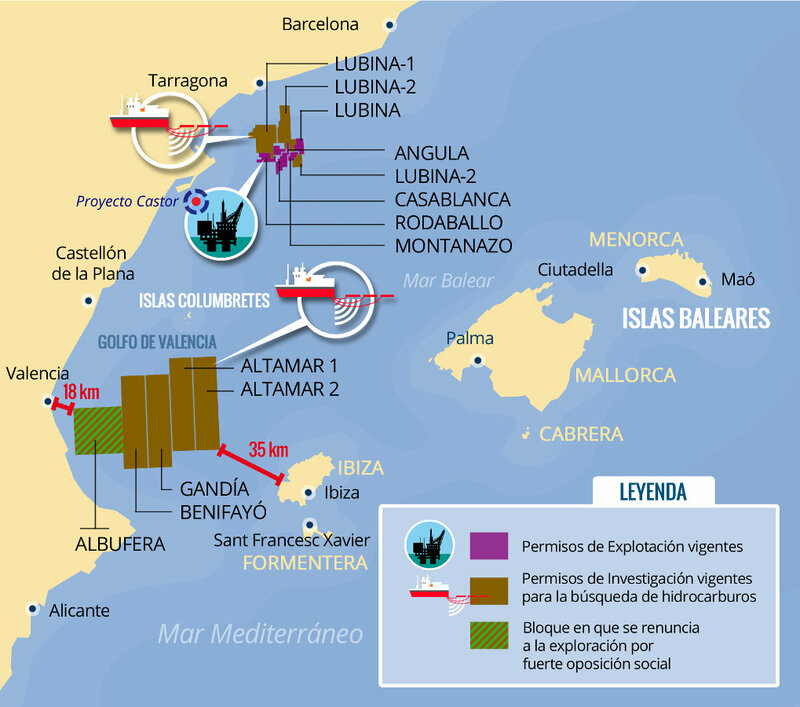 The Scottish oil company Cairn Energy, through its Spanish subsidiary Capricorn Spain, intend to look for oil or gas under the seabed of the Gulf of Valencia in a submarine area equivalent to about six times the size of Ibiza and Formentera together and is located between the coast of Valencia (at a distance of 5 to 10 kilometres) and west of the coast of the island of Ibiza (between 35 and 40 kilometres). This project, whose research stages Cairn Energy is committed to investing a minimum of 82.410.000€, is part of a series of similar projects in different oil companies along the entire Spanish coast from the Gulf of Lyon to the Canary islands, through the Ebro delta and the Alboran Sea. This proliferation of exploration projects is extended around the Mediterranean, a sea closely interconnected, and may result in the accumulation of several harmful effects on very fragile environments that are currently under multiple pressure. However this oil exploration project is not an inevitable reality. Proof of this is that originally the prospecting area was divided into five blocks called: Albufera , Benifayó , Gandia , Alta Mar 1 and Alta Mar 2, but the social pressure in Valencia and the Balearic Islands has made the oil company decide not to pursue at one of the areas closest to the Albufera of Valencia( Albufera block ) . Also, the company still lacks the necessary environmental permits to conduct any marine exploration activities within the project. As for the other four tendered areas, the project contemplates the possibility of drilling seabed located at a depth of between 50 and 2,000 meters. Operate in “deep water”, from about 500m, poses greater risks in the research stages and extraction due to the extremely high pressures, low visibility and the inability of human access to the mouth of the wells. Exploration and possible exploitation of these hydrocarbons could have serious impacts on the environment and the economy of the Peninsular and Balearic coasts and could affect strategic sectors such as tourism and fisheries, which depend on good environment condition in the Gulf of Valencia. Granted by the Council of Ministers. Valid until January 2017, being extended. Gandía BOE 19th August 2006 RD 1775/2010, from 23 December, and published on BOE 22th January 2011. One year after, by ministerial order ITC/3599/2011, and published in the BOE 2nd January 2012, Complete transfers of licenses to MedOil to another subsidiary of Cairn Energy to be published: Capricorn Spain Limited. The Albufera block has not been processed for environmental permits. Alta Mar 2 BOE 20th September 2008 RD 1774/2010, from 23 December, and published on BOE 22th January 2011. Correction of errors from RD 1774/201, from 23 December, via BOE 3rd February 2011.